Is this a ribbon or a trim? Not sure but it is scrummy. 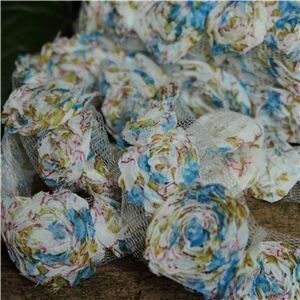 Lengths of chiffon ribbon cut into strips and sewn to make flowers. The flowers are sewn onto a net backing, which can be trimmed away. The largest rose is approx 3.5cm from edge to edge. Several different size rose are sewn to the netting.